As I round the corner to my 140th of the year, I can say WHAT WE SEE WHEN WE READ stands atop as the most brilliant I’ve read of all. Arranged both conceptually and visually in mouth-gaping magnificence, genius Peter Mendelsund captures the very essence—the shared bond—of our reading pleasure. The author is a master artist, both visually and now narratively. This is his magnum opus. This is why we read. In a mix of narrative and art, Mendelsund stretches our imagination and believability: he says exactly what we think, without us perhaps realizing what we have thought. Absurd, maybe, but once you begin his book, you’ll find a close association to the truth he speaks. Every reader, every writer, every artist needs to read this book. As a reviewer of books, I have the onus to present the image and flavor of a book, but at the same time not to spoil the opportunity for you to co-create your experience as the author intended. 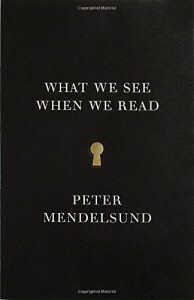 As Mendelsund writes, “Among the great mysteries of life is this fact: the world presents itself to us and we take in the world. We don’t see the seams, the cracks, and the imperfections.” This quote is set atop a darkened map with white cracks outlined. You flip the page. The author writes, “We haven’t missed a thing.” This is sided with a picture of Anna Karenina, x-ed out from the parts unknown, with her beauty intact. I can give no higher praise to this masterpiece. It is something you need to read and own. And for that, I thank Vintage Books and Penguin Random House for sending this book to me for review. It clarifies and presents my reading passion anew.